Thesmartsearch.net is not an interactive search engine. The start page of this search engine only presents the “Smart Search” logo and displays a search box. When you enter keywords into the search box, you are routed to either thesmartsearch.net/search or to duckduckgo.com. Both of these search tools display content related to your search queries, which is why we cannot identify the search tool as a useless program. The issue is that the search engine may replace the search tools you have selected yourself without any permission. In this case, you ought to delete this search tool as a browser hijacker. Read the article to learn how to delete Thesmartsearch.net. 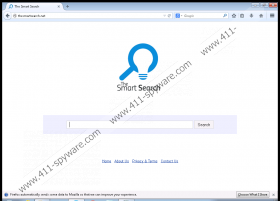 Of course, you cannot postpone or further discuss the removal of Thesmartsearch.net, if you are certain that it has corrupted your browsers as a browser hijacker. Uninvited, intrusive programs should never be welcomed, even if they are harmless. On the other hand, are you sure that you need to remove Thesmartsearch.net as a browser hijacker? Is it possible that you may have had the opportunity to refuse the installation of this suspicious search tool? If the search tool was installed as an addition to other programs, you need to analyze them. In the worst case scenario, you will need to remove them from your PC as well. Needless to say, if you do not take any measures, you will not know if your system is clean and if malicious apps await removal. Follow the manual removal guide to remove Thesmartsearch.net from your browsers. The guides show how to delete Thesmartsearch.net from Chrome, Firefox, and Internet Explorer browsers. Have you discovered that the search tool has corrupted other browsers? Notify us about this, and we will extend the removal guide for you. You should also not skip the installation of the reliable security software. This software will guarantee that no malicious programs can affect your operating system. Open the browser and simultaneously tap Alt+F to open the Chrome menu. Find the On Startup section, choose Open a specific page or set of pages, and click Set pages. Locate the URL of the undesirable search tool, remove/overwrite it, and click OK.
Go to the Appearance section, select Show Home button, click Change, and repeat step 3. Navigate to Search, click Manage search engines…, and apply a new default search engine. To remove the undesirable search engine, navigate to the URL, and click the X. Click Done. Open the browser and find the Firefox search box on the top-right corner. Click the icon on the left of the search box to open a menu and click Manage Search Engines. Select the undesirable search provider, click the Remove button, and click OK.
Click the General tab on the left of the menu, change/remove the Home Page, and click OK.
Open the browser and simultaneously tap Alt+T to open the Tools menu. Select Manage Add-ons, click Search Providers, and apply new default search engine. Select the undesirable search provider, click the Remove button, and click Close. Simultaneously tap Alt+T to open the Tools menu again and select Internet Options. Click the General tab on the left, change/remove the Home Page URL, and click OK.